The court martial of seven UK soldiers over the alleged abuse of Iraqi civilians is the first time British servicemen have been prosecuted for war crimes under the International Criminal Court Act 2001. The legal process has now finished with just one of them convicted - after he pleaded guilty to a charge of inhumane treatment. The other six have been cleared. When Cpl Donald Payne, 35, of the Queen's Lancashire Regiment (QLR) admitted a charge of inhumane treatment at the start of the proceedings in September 2006, he became Britain's first convicted war criminal. The prosecution told the court martial Cpl Payne had "enjoyed" hearing Iraqis call out in pain as they were kicked and punched while in a detention centre and that he referred to the noises made as "the choir". "I would ask the court to handle with care the person who admitted the crime," he said. The prosecution said that, said that while undergoing so-called conditioning for interrogation, the group were forced to stand in a painful posture. 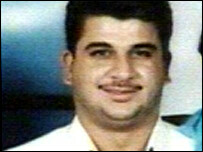 One of the detainees, Baha Mousa, 26, later died in custody. It was found he had 93 separate injuries to his body. Despite Cpl Payne's guilty plea, it was another of the men who emerged as the most high profile - commanding officer Col Jorge Mendonca MBE. 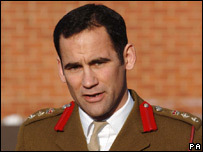 The 43-year-old former commander of the QLR - and the highest-ranking British serviceman in recent history to face a court martial - was cleared on 14 February of negligently performing a duty. Col Mendonca, who had won a distinguished service order (DSO), earned praise during the hearing from another former Basra commander as "the best commanding officer by some way". When he was cleared, alongside three of his men, he said he remained convinced his soldiers had done "enormous good" in Basra in 2003. "Every one of my soldiers and officers worked extremely hard under indescribably difficult conditions to make Basra a better place, and I just hope that fact is not forgotten in the aftermath of this trial," he said. On the same day Col Mendonca was cleared, L/Cpl Wayne Crowcroft, 22, and Pte Darren Fallon, 23, both of the QLR (which is now merged with the Duke of Lancaster's Regiment) were cleared of treating Iraqis inhumanely. Sgt Kelvin Stacey, 30, was cleared of the last remaining assault charges against him, having been cleared of other assault charges in January. And Cpl Payne was cleared of manslaughter and perverting the course of justice. Mr Justice Stuart McKinnon had ordered the charges to be thrown out because of a lack of evidence. That left just two of the seven to be tried as the court martial continued. Maj Michael Peebles, 35, Warrant Officer Mark Davies, 37, both of the Intelligence Corps, faced charges of negligently performing the duty of ensuring the detainees were not abused by men under their control. They, too, were cleared as the proceedings ended on 12 March.